This superb Oscar nominated documentary will give you one of the most intense and harrowing cinematic experiences of the year. The film follows young America climber Alex Honnold as he prepares to become the first person to scale the sheer face of the 3000 foot high El Capitan Wall in Yosemite National Park. Honnold has climbed El Capitan many times before, but this is the first time he has attempted the feat without the aid of ropes and other safety devices. Honnold has spent much of his life climbing massive peaks, preferring to climb free solo, ie: without ropes and harnesses. He thrives on the physical challenge of this high risk activity. A film crew, led by Award winning husband and wife team of Jimmy Chin (himself a mountaineer and cinematographer) and Elizabeth Chai Vasarhelyi (the documentary Meru, etc) follow his mental and physical preparation for this momentous climb. The filmmakers spent some two years working on the project. 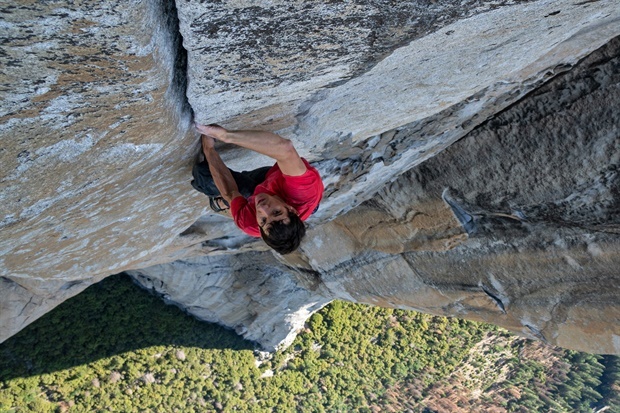 The filmmakers give us some insight into Honnold’s personal life as well. He basically lives out of a van, enjoys a rustic, nomadic lifestyle and is obsessed with climbing mountains. However, Honnold is not very good at dealing with human connection, and one suspects that he lies somewhere on the autism spectrum. But somehow he has recently found a girl friend in Sanni McCandless, who supports him but also worries about him. The pair have recently bought a house together, but he seems a little uncomfortable with a domestic life. Both Sanni and the film crew help us to understand Alex’s personality a little better and also help us to understand the enormous risks he faces every time he undergoes one of his climbs. We are reminded of how many other free solo climbers have died tragically while pursuing their thirst for high risk adventure. As a mountaineer himself Chin is acutely aware of the enormity of the challenge, the risks and dangers this climb represents, and at times he and his crew question the ethics of filming Honnold knowing that the climb could well be fatal. The film itself was shot using a combination of drone cameras and a professional crew of rock climbing cameramen, all friends of Honnold, who were attached to a system of ropes and harnesses. But it is in the last thirty minutes or so that the documentary really comes alive with the gripping climb itself as Alex precariously uses small clefts in the rock face as hand and feet holds. This is heart-in-mouth stuff, and Marco Beltrami’s score effectively adds to the sense of tension. While it took Alex just under four hours to complete the climb, here veteran editor Bob Eisenhardt (who worked with Chin on Meru) deftly wrings suspense from the sequence with effective use of montages. These spectacular climbing sequences are extremely vertiginous and nerve wracking to watch, and will have audiences on the edge of their seat. There are also some spectacular wide, panoramic shots of Yosemite itself, to help put Alex’s climb into perspective. Free Solo is a visually stunning documentary that deserves to be seen on the biggest screen possible. Not for the faint hearted or those scared of heights!